We all know how important Social Media is and we all know that it HAS to be a part of your blog or business marketing game plan. What I want to talk about is people trying to over complicate or over learn what social media is and how to use it. Social Media at it’s core is very simple..you share and get shared and talk to people and you do that on a regular basis.. there you go… you are now a Social Media expert! 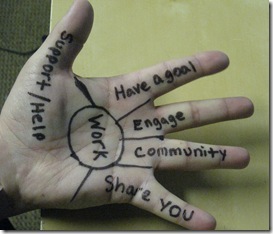 So wanting to write something to help you understand SM easily, I was thinking of a way to explain it as I was staring at my hand when.. EUREKA! Your Hand John?…It’s a good a place as any for a post idea…Right? What came to me was how you can learn all you need about Social media in only 5 Fingers. Yep..that’s right! ALL you need to know about SM is sitting there in the palm of your hand. Thanks for the mention of my blog post. I tweeted your article.